Hawaii 5O or Can I get off the couch enough to become an age group World Champion? Challenge Barcelona 2013, 180km is not enough. In a curious mix of beer festival and international long distance triathlon, every year over the first weekend in October these two somewhat different ideologies converge on Calella, a moderately sized town about an hour’s drive north along the coast from Barcelona. For a few days Calella is overrun by hoards of retired German couples in tightly fitting beer festival T-shirts, lycra clad mainly middle aged men; many of them German too, but also included are a good sprinkling of other nationalities even some Irish. The town is awash with brass bands and bikes. It’s an interesting but compelling mix of music, revelry and suffering. I get the impression the beer festival is more about the brass than the beer. I was there to do my 14th long distance triathlon in eight years and was hoping to repeat my 2011 result by winning my age group. Possibly even shave a few minutes off my previous time. The race was on Sunday and I arrived on Thursday night. On Friday morning I stood with my younger brother on a fabulous beach facing the sea. Both of us were trying to summon the courage to enter the water for a practice swim. There was quite a swell and considerable waves breaking right at the shores edge. Justin timed his entry well and got through the surf unscathed. I on the other hand was picked up stripped of my goggles and hat, very nearly my wetsuit too, face planted into the sand and deposited back on the beach. I managed to get through on a second attempt. We had a short roller coaster of a practice swim before Justin and I learnt the painful lesson that getting out was even harder than getting in. It was Justin’s turn to lose some gear. It was going to be a tough start to the race if conditions didn’t improve. Thankfully they did ease. It was a warm and sunny Sunday morning that greeted the 1,500 starters. But there were storm clouds gathering that might affect the race later on. As one of the older athletes I was starting in a later group. Watching the youngsters and professionals start ahead and battle the current I knew it was going to be a slow swim. It was and probably half a kilometre longer than the 3.8km it was supposed to be too. But I felt I swam well catching plenty of the earlier starters and was amongst the first of the aulfellas out of the water. But at one hour eight minutes my time was well down on what I had expected. But so was everyone else’s. The bike started in near perfect race conditions. Neither too hot, nor windy and the roads were dry. I soon got into my rhythm catching many more of the early starters and slowly working my way towards the top end of the amateur race. The timing chip on my ankle was beaming my position over the internet telling my family back home that I was leading my age group and making good progress. The professionals were well ahead and storming through the flat 180km bike course at blistering speed. The bike course was set up as a three lap out and back route along an increasingly windy coastal road that brought us to the outskirts of Barcelona. The third lap was shorter than the previous two. On the last lap out to Barcelona we were to turn at a roundabout about half way and head back to Calella for the marathon start. There were many roundabouts on the course but the turnabout wasn’t clearly marked. Having done this race two years ago I was confident I knew which one it was. To turn for home in a race like this is a great morale boost. At this stage I was pleased with my days work so far. I had swum and cycled well overtaking many hundreds of people who had started ahead of me. So much so the road ahead was clear except for some much slower cyclists heading out in the distance to complete an earlier lap. I had caught Justin who looked to be moving very nicely too. It took me a lot longer to catch him than I had expected – he was on for a new personal best time I reckoned. I hit the last turnaround point and noticed the complete lack of signage. That I thought might cause problems for others not as familiar with the course as myself. To miss the turnaround and keep going would be a sickener. Happy to be on the way home, though tiring I pushed on hard looking forward to the marathon to come. After a while as I approached yet another roundabout I noticed a large group apparently cutting the course short and turning around at this roundabout. Cheating b…’s. I don’t understand that mentality at all. As I continued I noticed more and more competitors do the same. My heart sank, I was gutted. I had got it wrong. I had added an extra 12 kilometres to what is already a rather long cycle and had just lost hundreds of places. I was angry with myself and tried to set about undoing some of the damage. All I could think about was the year’s wasted training. About twenty minutes from the finish of the bike the heavens opened up slowing everyone down considerably. Biblical rain flooded the back end of the cycle course into town. I have never had to cycle through sea before but that’s what it was like. It didn’t help knowing that if it wasn’t for my mistake I would have been off the bike before the rain and enjoying its cooling effect at the start of the run. 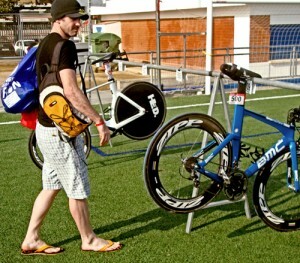 Eventually I was finished with the bike and into transition. It fell to the ground on the way to my bike rack and somehow I resisted the urge to kick it the last few meters into place – I really wanted to. Probably didn’t have the energy anyway. Needless to say I started the run still angry. My head was no longer in the right place. I put a lot of time into training for this event. I have made sacrifices, as have my family to get me here. My whole year was geared towards this one race and I knew in my heart that any chance of repeating my previous result was gone. My aim was damage limitation now. I have never been slower than 10 hours in any race, it’s a record I am particularly proud of and one I would like to keep going. I settled into a reasonable pace but the constant reminders of how far back I was kept chipping away at my resolve. I have never seen so many people ahead of me on the run, many I recognised as people I had passed very early on the bike too. Justin was also well ahead of me again. The fireworks display for the winner finishing as I was still on my first lap of four didn’t help my mood. But this is a great race, I liked the run course, it was well supported and the crowds were a great lift. The brass bands out for the beer festival added to a marvellous atmosphere. My mood lightened. Even though I was still a little angry with myself I pushed it to the back of my mind and began to enjoy the race again. In the end I was delighted to finish under the ten hours and I was equally delighted for Justin. His time of 10 hours and one minute was a 50 minute personal best. I am sure he will be back to lose that one minute; though I suspect he will be well under the ten hours next time. In all my fourteen Ironman triathlons I could only point to one or two that have gone nearly to plan. Any long distance triathlon will always throw up something unexpected. Its how you deal with it that makes the race. I didn’t win my age group. I got sixth. All things considered it wasn’t a bad result. I was glad to have done it and will hopefully be back again. Myself and the brother got home safely and that’s what is important. The Moon Landing, tackling my kids and Wheelworx. A kick in the …. on Another Year Another Go. Kevin o sullivan on Another Year Another Go. on A kick in the …. Kev on A kick in the ….